TAÏB FASSI FIHRI, Minister for Foreign Affairs and Cooperation of Morocco, began by acknowledging that the current world crisis was an additional impetus to buttress collective action and strengthen coordination among constituents of the United Nations. He declared that, “Today, the world is witnessing recurrent and unprecedented crises in the economic, food and energy field that have shaken the premises of universal governance.” Because the United Nations embodied the collective conscience of the international community, it was the most appropriate forum for coordinated joint action and an appropriate forum to analyse the root causes of these crises and mitigate their effects. Recalling that the Millennium Development Goals had been adopted as a common platform of action for human development, he said that the remaining years between now and 2015 required that “we adopt a global and coordinated approach” to build a partnership to mobilize additional financial resources. He hoped that the fourth high-level meeting on financing for development in November would yield results commensurate with the expectations of developing countries. He urged United Nations development agencies to mainstream the Goals in their policies and programmes. In keeping with a vision of greater development, His Majesty Mohammed VI had launched the National Initiative for Human Development in May 2005. The initiative was based on an integrated approach to development in terms of political, economic, social, environmental and cultural dimensions. It also included continuous evaluation, resource mobilization, strenuous follow up and engagement of citizens. However, “collective efforts in the field of development would remain inefficient unless they are accompanied by daring and active policies for the protection of the environment”. He was convinced that the Copenhagen conference would be an important step towards an international agreement. Thus, he reiterated a proposal made in Poznan, Poland, in December 2008, which called for the creation of a multilateral fund for the transfer of technology to the developing countries, which would enable them to deal with the grave implications of climate change. In terms of Iraq, he said that Morocco resolutely “supports the sovereignty, unity and territorial integrity of this brotherly country”. That sensitive region was in dire need of a “positive and targeted action independent of foreign interference”. He reaffirmed Morocco’s desire to consolidate good relations with its neighbours within the African, Maghreb and Mediterranean regions. 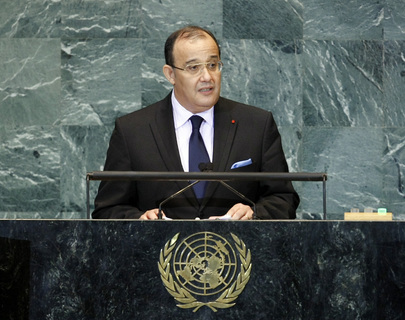 Morocco supported the Mediterranean Union as a promising framework to enhance dialogue and cooperation between the two sides of the Mediterranean Sea. King Mohammad VI expressed Morocco’s strong and standing resolve to contribute in good faith to the consolidation of the Maghreb Arab Union and to reactivate its structures and strengthen relations among its five members. He added that the regional body could play a role in building partnerships and ensure security and stability.